3 ft. 7 ft. 10 ft. 14 ft. 25 ft. 50 ft. 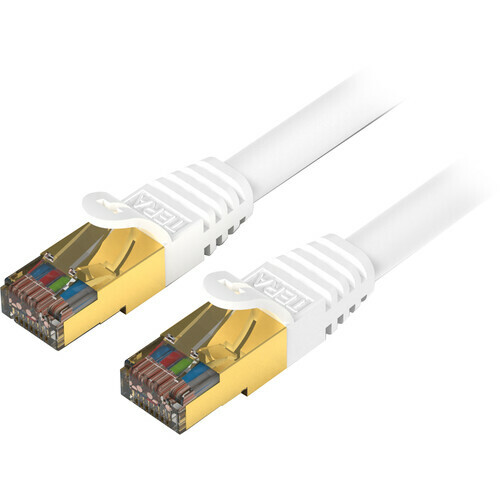 The white Premium Cat7 Double-Shielded 10 Gigabit 600 MHz Ethernet Cable from Tera Grand is 3' long and rated for transmission frequencies up to 600 MHz, making it suitable for 10 Gigabit Ethernet environments. Tera Grand has shielded each pair of wires with aluminum Mylar foil and then bundled these pairs with an 85% tinned copper braid to improve noise resistance, as well as almost completely eliminate alien crosstalk (AXT). Moreover, the RJ45 connectors have 50 micron of gold plating for protection against EMI/RFI interference. Box Dimensions (LxWxH) 7.2 x 4.3 x 1.3"
Premium Cat7 Double-Shielded 10Gb 600 MHz Cable (White, 3') is rated 4.8 out of 5 by 6. Rated 4 out of 5 by cjurczak from Good Cable for the Money I am not actually using this as a CAT7 cable. I needed shielded cable with a RJ-45 connector. But the cable and it's shielding is of good quality. The connectors are well molded, and gold plated. My only complaint is it didn't want to connect unless really pushed in all the way. Rated 5 out of 5 by Vache from Solid and reliable cable Thick solid gauge cable with high bandwidth and gold plated connectors, I have faster load times and faster speed and I don't have to upgrade to any other cable. Rated 5 out of 5 by Cariduro from Awesome Cable works great, good quality and durability . completely satisfied with the performance. No issues. Rated 5 out of 5 by @Security_Kr from Good :-) Data transfer speed is quite fast and stable feel ... good, thick cable. Would this particular Category 7 network cable be fully backwards compatible with Category 6, 6e and Catergory 5 network cable speeds? Is this good from a modem to a switch, if I'm just on ADSL2+ bonded?